S.U.H.O.G. 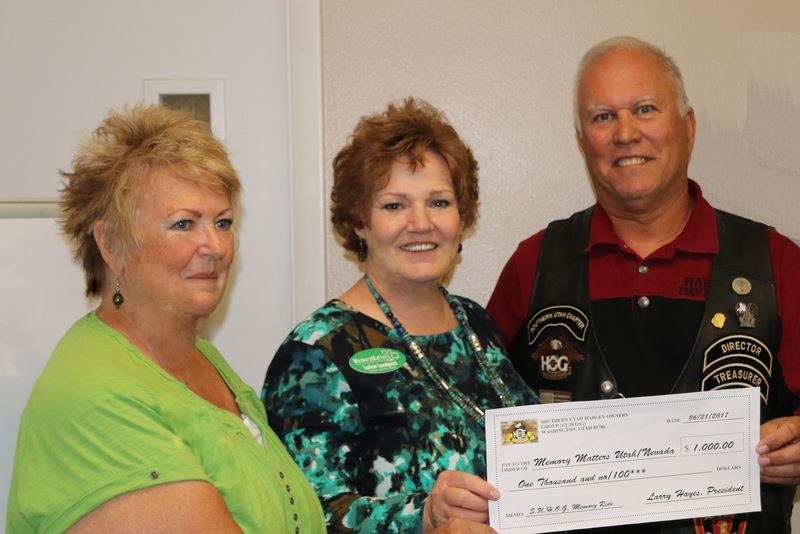 members Larry Hayes, Gladys Commes and Cheri Hayes presented the check Wednesday to LuAnn Lundquist, founder and executive director of Memory Matters. The proceeds from the Memory Ride will go to fund local Memory Matters’ programs, including information and referral services, support groups, care consultations, memory testing consultations, outreach and education events, early stage memory loss classes, memory activity classes and the “Good Morning Sunshine” wellness calling program. S.U.H.O.G is a nonprofit organization through which members participate in regular weekend events that raise both funds and awareness for local charities. Memory Matters is a nonprofit organization based in Southern Utah and Nevada working to reduce isolation and improve wellness for individuals with dementia and their caregivers through activities, support, education and consultation.